Depending on who is on the boat, the date of reservation, how many boats are rented at the same time, you may be eligible for discounts that can be combined. 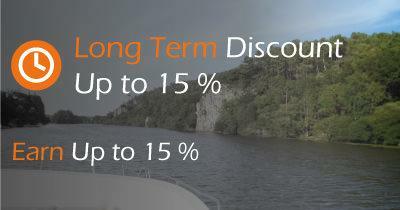 All year round we offer you cumulative discounts between them, so that you can rent your barge without a license at the best price. 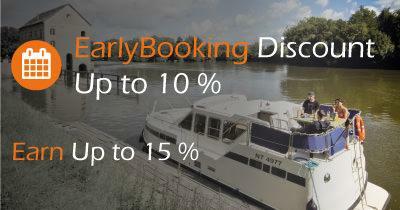 Most of our discounts are valid for a river cruise anywhere in France (Canal du Midi, Burgundy, Brittany, Alsace, Mayenne, Aquitaine, ...). To find the boats and cruises available, do a search via the blue bar above and you will get the rental rates (all discounts included). 5 % discount if you reserve a minimum one-week holiday 120 days before the departure date; 8 % discount if you reserve a holiday of at least a week before 31/01/2017; 10 % before 31/12/2016. 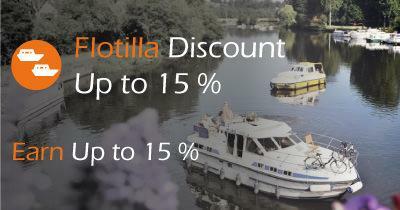 Please note there is a 10 % discount for short breaks or one week reservations made before 31/12/2016 on the following boats: Estivale fleet, Sedan 1310, 1170, 1160 N, 1160, 1150, 1010, 1000, Confort 900, 900 DP, 1100, 1350, 1350 VIP, Riviera 920, 1120 and 1130. Available when there are only two persons onboard on the following boats : Tarpon 37 Duo Prestige, Haines 34, Confort 900 A, Confort 900, Confort 900 DP, Sedan 1000, Sedan 1010, Triton 860 Fly, Triton 860, Espade 850 Fly, Pénichette 935 W, Eau-Claire 930 Fly, Eau-Claire 930, Renaud 8000 (except Cahors, for Redon, only for booking of 1 week minimum). 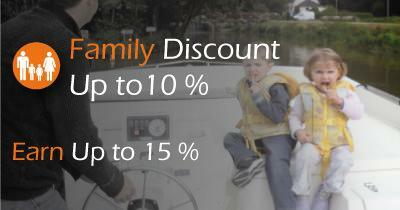 5 % when there is one child under 18 onboard and 10 % for 2 Children under 18 onboard on the day of departure (except Cahors, for booking of 1 week minimum from Pont à Bar and Redon). Caution limit is 16 on following boats : Estivale fleet, Sedan 1310, 1170, 1160 N, 1160, 1150, 1010, 1000, Confort 900, 900 DP, 1100, 1350, 1350 VIP, Riviera 920, 1120 and 1130. 6 % when at least 1 person over 60 onboard (except E and F period, and from Cahors and Pont à Bar, for booking of 1 week minimum from Redon). Caution limit is 65 and discount is 5 % on following boats : Estivale fleet, Sedan 1310, 1170, 1160 N, 1160, 1150, 1010, 1000, Confort 900, 900 DP, 1100, 1350, 1350 VIP, Riviera 920, 1120 and 1130. 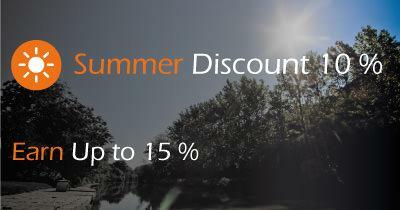 5 % from 8 to 14 nights, 10 % from 15 to 21 nights, 15 % from 22 to 28 nights. 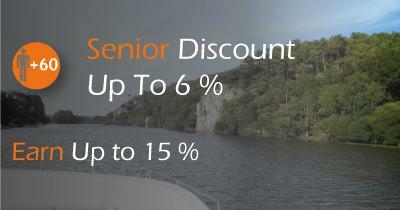 Caution discount is 10 % on the second week on following boats : Estivale fleet, Sedan 1310, 1170, 1160 N, 1160, 1150, 1010, 1000, Confort 900, 900 DP, 1100, 1350, 1350 VIP, Riviera 920, 1120 and 1130..
5 % when 2 boats are cruising together at least one week, 10 % for 3 boats, 15 % for 4 boats. Caution discount is 7 % for 3 boats and 10 ù for 4 boats on following boats : Estivale fleet, Sedan 1310, 1170, 1160 N, 1160, 1150, 1010, 1000, Confort 900, 900 DP, 1100, 1350, 1350 VIP, Riviera 920, 1120 and 1130. In this cas, it also available for short stay. 10 % for a booking made from 01/01/2017 tp 03/31/2017 for a stay between the 07/01/2017 and the 08/31/2017, available only on following boats : Estivale fleet, Sedan 1310, 1170, 1160 N, 1160, 1150, 1010, 1000, Confort 900, 900 DP, 1100, 1350, 1350 VIP, Riviera 920, 1120 and 1130. 10 % for a booking made from 01/01/2017 to 06/30/2017 for a stay between the 10/01/2017 and the 11/15/2017, only on following boats : Estivale fleet, Sedan 1310, 1170, 1160 N, 1160, 1150, 1010, 1000, Confort 900, 900 DP, 1100, 1350, 1350 VIP, Riviera 920, 1120 and 1130.